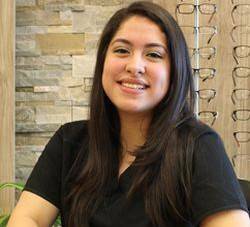 Deysy joined our team in September, 2015 with great enthusiasm and the biggest and birghtest smile in Texas! She graduated from an online home schooling program in 2014 and is currently attending Houston Community College, Katy Campus while working on a full time basis at Optomedica. Deysy’s primary duties at Optomedica include scheduling appointments, answering phones, and checking patients in and out. Prior to joining our team, Deysy worked in accounting which helped her develop not only great customer service, but also attention to detail. Deysy was born and raised in Katy, Texas. Deysy is the proud mother of a four year old and loves playful times in the park as well as reading a good book in a quiet place by herself. Luz joined Optomedica’s team in October, 2015. Luz graduated in Mexico with a certificate in Optical Sciences. She is in charge of our optical department and fully enjoys the experience of finding the best frame fitting for each patient she comes in contact with. 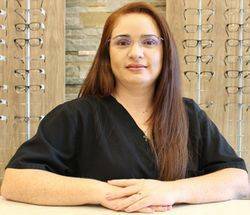 Luz truly believes a person’s glasses should not only feel comfortable and provide great vision, but should also reflect a person’s own life style, spirit, and thinking so that they look and feel great on their faces. Luz enjoys working with people of all ages and a good conversation to find out what a person’s interest and needs are to best fit him/her. Luz moved to Katy, Texas almost two years ago with her husband and two daughters. She chose Katy because it is a family oriented community where she can enjoy bringing up her two daughters and relaxing in a nice, peaceful environment while she is not at work. She loves taking care of her plants and is very active at her community church.